SPRING SPECIAL—BOOK BY THE END OF THE MONTH! Originally commissioned as Varsity Jacket and then becoming Strait Jacket, LADY SHARON GALE has a successful charter history a brand new updated interior and is ready to resume making memories of a vacation of a lifetime. On deck, Lady Sharon Gale offers an unusually large and multifunctional cockpit which is original to the yacht's construction. All outdoor living areas are easily accessed via comfortable stairs that transition from the cockpit to aft deck to the fly bridge. The fixed aluminum hardtop features an ingeniously engineered sun roof that offers the best of both worlds at the push of a button. LADY SHARON GALE’S interior is beautifully paneled in satin finished maple throughout. The furnishings, fabrics and stone are of the highest quality. The décor is cohesive and comfortable, and provides a perfect combination of informal elegance. The main salon caters to practical and informal day to day living with comfortable furnishings, a formal dining area with bar, living room area and full entertainment system. 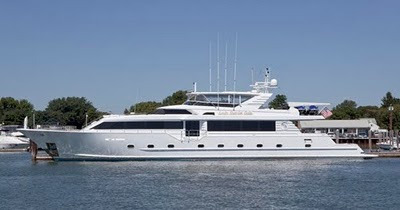 Forward in the galley, she features the enormous Broward "country kitchen" that provides for a casual dining space and comfortable are to converse with the chef. Below, the master stateroom features a king size bed, large flat screen TV with all of the entertainment options, cedar lined closet and his-and-hers baths. Two of the guest staterooms are identical, and offer a double bed in addition to one twin bed in each cabin. A VIP stateroom is unusually large, and features a queen size bed, very large and comfortable ensuite bathroom with shower and occupies the entire bow area.